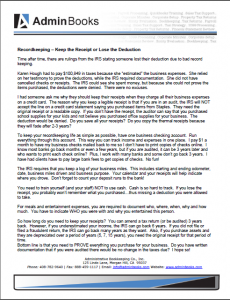 Karen Hough had to pay $100,849 in taxes because she “estimated” the business expenses. She relied on her testimony to prove the deductions, while the IRS required documentation. She did not have cancelled checks or receipts. The IRS could see she spent money, but because she could not prove the items purchased, the deductions were denied. There were no excuses. To keep your recordkeeping life as simple as possible, have one business checking account. Run everything through this account. This way you can track income and expenses in one place. The IRS requires that you keep a log of your business miles. This includes starting and ending odometer, date, business miles driven and business purpose. Your calendar and your receipts will help indicate where you drove. Don’t forget to count your deposit runs to the bank! Renee has put together great reasons you need to “Keep That Receipt!”. Please enter your address at the top of the page, and we’ll send the report straight into that Inbox. How’s that for instant satisfaction? 3. Why is it NOT okay to use CASH? 4. How long should you keep your receipts?